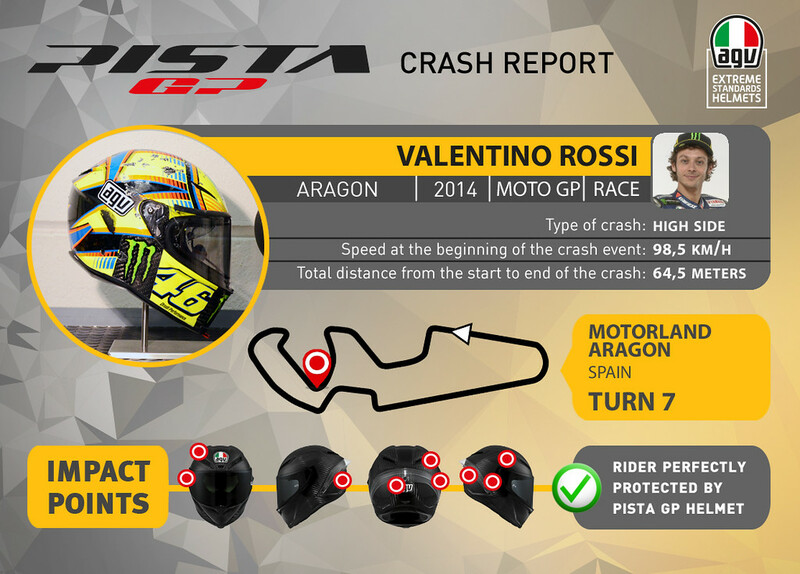 Like all helmets that have been involved in falls or accidents in competitions in which AGV riders officially participate, the Pista GP helmet worn by Valentino Rossi at Aragon on 28 September was taken back to the factory and completely dismantled for a thorough technical analysis at the Group Research & Development Department. 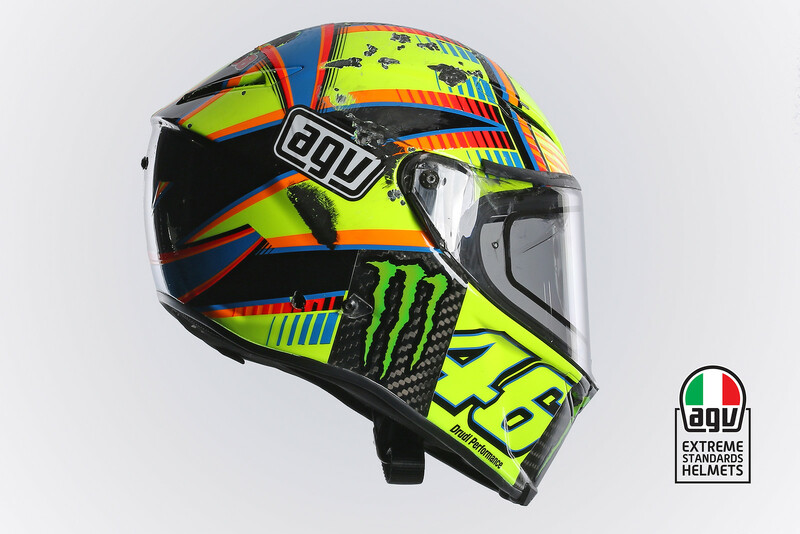 Tests carried out on Valentino’s helmet following his violent fall during the race, showed no critical structural failures and demonstrated how the helmet had perfectly absorbed the energy from the impact to protect his head from trauma injury. The outer shell shows clear signs of impact with the ground and with Valentino’s Yamaha M1 factory bike. The first impact was with the ground following his high side. 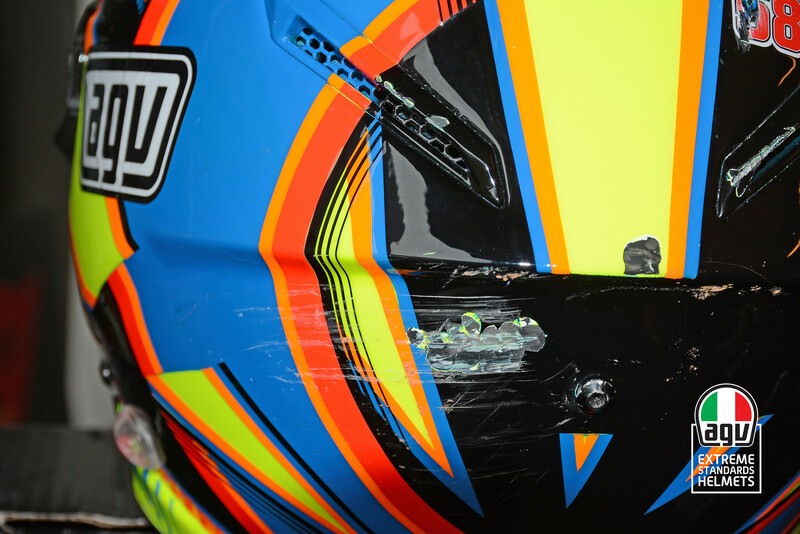 The rear left section of the helmet received the first blow close to the spoiler that broke off as it was designed to do. After Valentino tumbled a few times on the run-off area on the tarmac and gravel, the helmet then came into direct contact with the bike. 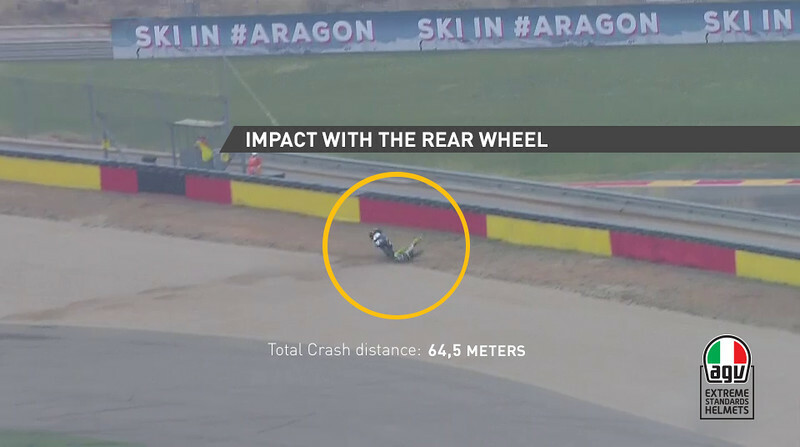 There are clear signs of a violent impact on the right side of the helmet between the outer shell and structural components on the rear of the M1 (swingarm and/or brake disc/caliper). There are also very evident traces of rubber on the right side of the outer shell and the visor that are obviously the result of contact between the spinning rear tyre and Valentino’s Pista GP helmet. 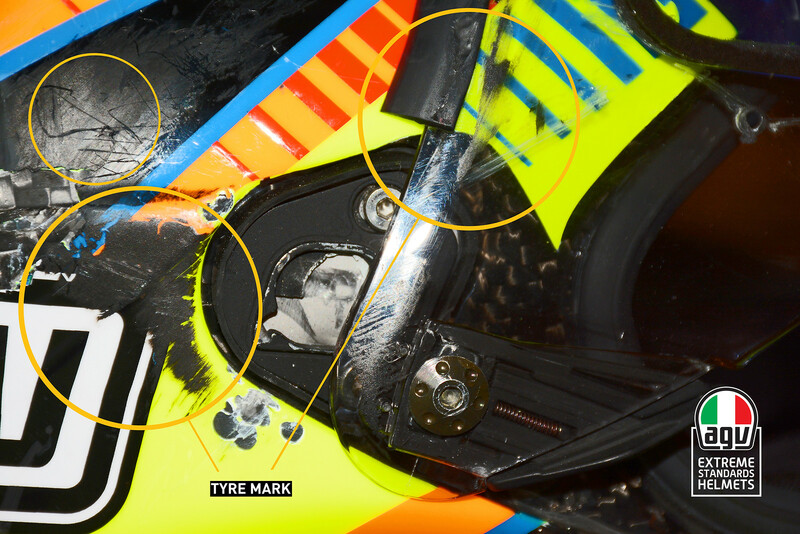 Severe friction between the tyre and the helmet tore the right part of the visor away from the shell and broke the metal swivel closing mechanism holding it in place. Although the visor was also cracked on the left side (again near the closing mechanism), it remained in place. 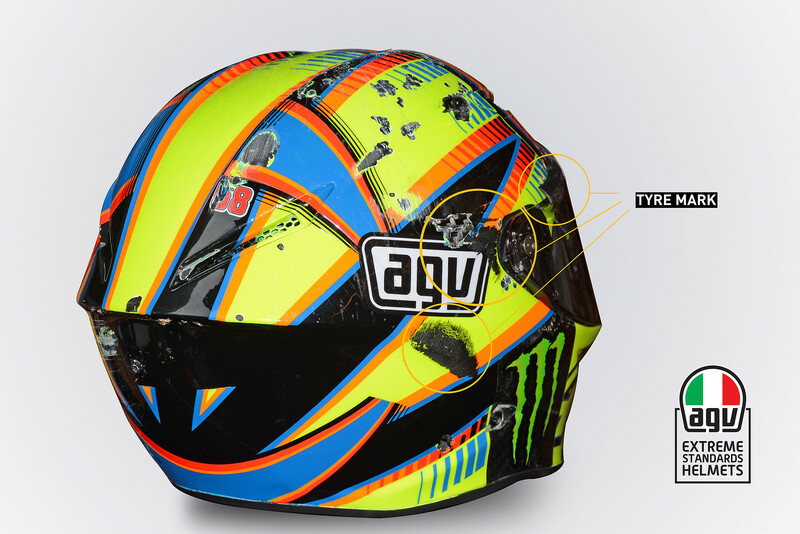 This degree of protection was further enhanced by the racing kit (additional metal screw which fastens the visor to the swivel mechanism) that AGV use on all its competition helmets. This kit is also available as an accessory for professional and private riders alike. 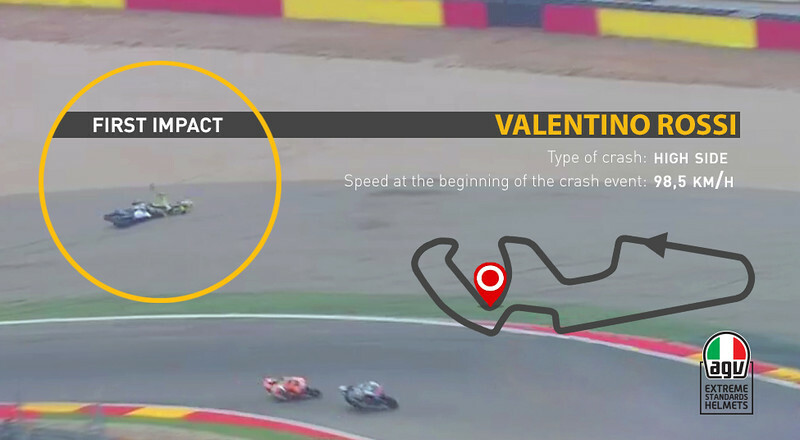 Valentino’s symptoms of temporary loss of memory and headache are probably due to the violent and sudden rotational acceleration of the head caused by contact between the helmet and the still spinning rear tyre. 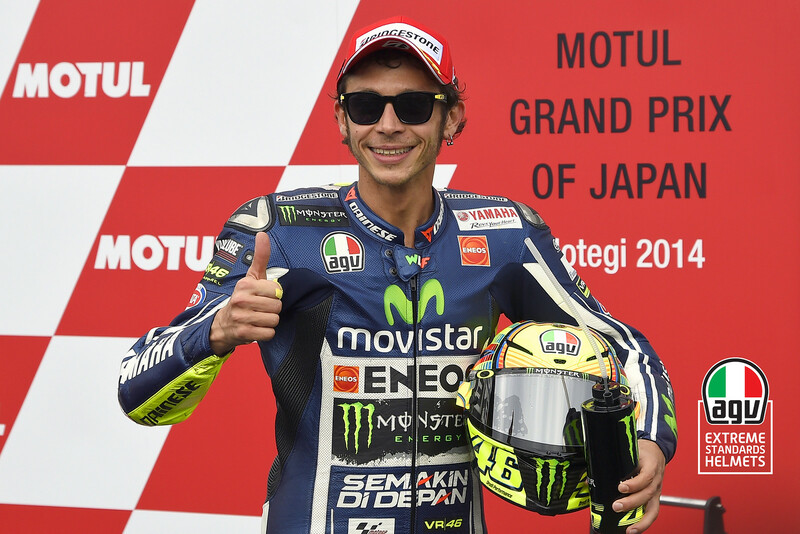 Thanks to AGV Extreme Standards Technologies, Valentino did not suffer any trauma injury and was able to race in the following Motegi grand Prix where he and his AGV Pista GP finished on the podium.